For women, there was artistic freedom in the monasteries. An insight that scenkonstgruppen Operabyrån transformed into a concert performance of medieval and baroque composing nuns. In one corner stands a mannequin with doc. But in the ”Mysterious sisters”, it is above all the music which play the main role. Behind the idea and concept is barockviolinisten Catalina Langborn and soprano Christina Larsson Malmberg. 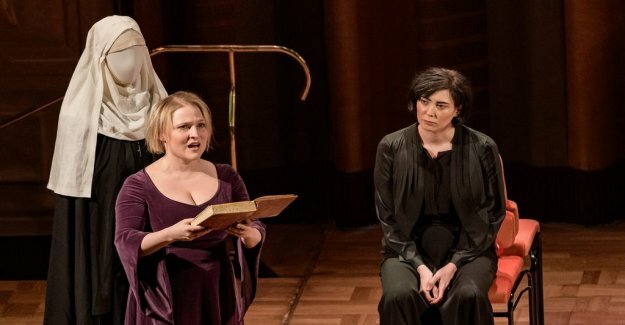 The history of music is as familiar a jigsaw puzzle of the above-mentioned and forgotten, but together with director Elisabet Ljungar and allert a small ensemble, they hop some of the early music of lesser-known tonsättarskap. From the byzantine poet, composer and saint Cassia, active sometime in the 800's, Isabella Leonarda, one of the most prolific composing the nuns in the 1600-century Italy. as the 1100-century composing abbess Hildegard of Bingen and requires a context. Therefore, the entry of the actor Joséphine Wistedt occasionally with short statements on monastic and women's living conditions. And if kändiskulturen that arose around the monasteries and the church's fear that these ”celestial sirens” would outrank the word of god. To relate freely to the facts is, of course, difficult, but Operabyråns speculative script is hardly unreasonable, even if you have chosen to take on a less accepted theory on Hildegard of Bingens a young age. The inspiration will, among other things, from Mary Sharratts novel ”the Illuminations”, but also from scientific studies. most Importantly, at the same time, the sounds: Kassias hymn of the converted courtesan Pelagia, where the soprano section is hovering over svirrande strings. But also Monteverdinära motets that Caterina Assandras ”Duo seraphim” and Rosa Giacinta Badallas koloraturrikt delicious hymn to the Virgin Mary. And Leonardas mörktonat dramatic violin sonata. ”Mysterious sisters” is a theatrical concert that both captivates and saves, with music that seems to sing of equal parts feminist as a divine force.